Do you have a Plumbing Emergency in Chicagoland? Let’s face it — the majority of the time homeowners call upon a plumber, it’s in an emergency situation. There’s never really a convenient time for a pipe to burst, a drain to clog or a toilet to malfunction. Fortunately, at Old World Plumbing we understand that these dire situations require immediate assistance and we’re committed to providing emergency services. Our customers know that just because they are having an emergency, they don’t deserve to be charged an arm and a leg for our services. Our reasonable rates are just one reason Chicagoland residents rely on us for emergency services. While some plumbing problems are nothing more than an annoyance, some become totally disrupting to you daily life and might even threaten the well-being of your property. Residents of Kane, Kendall, Cook and DuPage Counties can rely on Old World Plumbing to attend to any plumbing matter, whether it merely presents an inconvenience or qualifies as a full-on emergency. What might be an inconvenience to one person could be an emergency situation to another, but at Old World Plumbing, we don’t judge. When you call, we come to assist, regardless of the perceived severity of the situation. Once a sump pump or ejector pump fails, you’re at serious risk of flooding, which leads to property damage and potential health risks. If you have an ejector pump that you rely on for pushing out wastewater, failure means that you’re not going to be able to use toilets, washing machines or sinks that are tied to that pump. This means you need immediate assistance to get it repaired or replaced. At Old World Plumbing, we have installed many battery backup systems for sump pumps, because when the power goes out during a big rain storm, you need your sump pump to remain active and doing its job to remove water from your subgrade rooms. Regardless of the problem, Old World Plumbing has the expertise to get you back online. 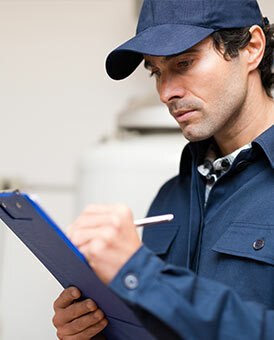 Hard water, age, improper installation and faulty parts can all bring your water heater to its proverbial knees. Most often, you’ll notice that your hot water isn’t as abundant as it once was — or that you simply do not have any. Perhaps you’ve noticed a funky smell and discoloration to your hot water? These are signs that it’s time to call Old World Plumbing. Any number of things can go wrong with a water heater, such as a faulty valve, malfunctioning gas lines (for the gas units), failed heating elements (for the electric units), bad switches, rusting tank, leaking tank, etc. Regardless of your water heater emergency, Old World Plumbing can assist. One of the most common emergencies that plumbers are called for is in relation to sewer and drain malfunctions. While these are mostly out of sight and out of mind, once the water fails to drain as it always has or if sewer gas suddenly creeps into the house, residents are suddenly reminded of how integral these components are to a functioning plumbing system. Old World Plumbing offers rodding, jet rodding and a number of other services to diagnose and take care of sewer and drain issues. A burst or leaking pipe can flood a home with hundreds of gallons of water over a 24-hour period. Whether it’s caused by years of mineral debris lining the inside of the pipes or frigid winter temperatures causing water to freeze and damage the pipes, Old World plumbing has the expertise to offer top-notch piping repair services. We will insulate those pipes that susceptible to freezing, thaw pipes that are already frozen, repair pipes in a variety of materials or completely replace old pipes – we’ve got all the emergency piping repair and replacement services you need. Plumbing emergencies don’t always happen during the waking hours or on regular work days. At Old World Plumbing, we know that an emergency can strike at any moment in the basement, bathroom, kitchen, and in the laundry room. Wherever your emergency occurs, we have a comprehensive list of services for any emergency, regardless of the time of day. When you need 24-hour plumbing services, call us at (630) 315-0888.